THE Knotty Coach Trust is hopeful that its North Staffordshire Railway four-wheel Brake Third could be ready for traffic as early as August next year. It was discovered near Rudyard Lake three years ago. 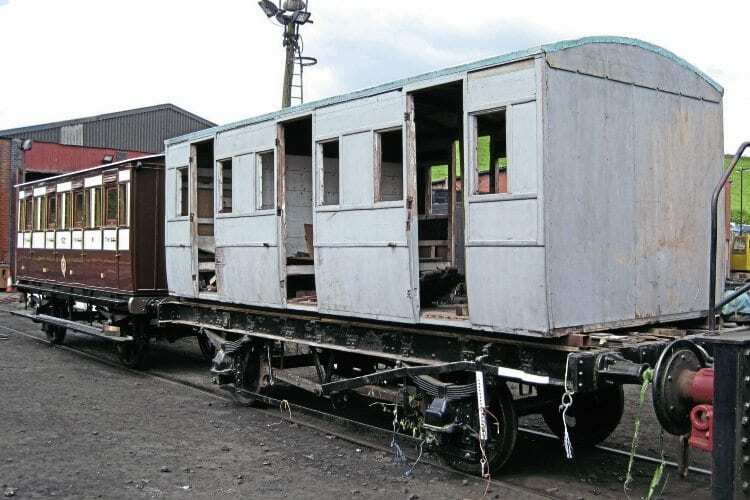 The Foxfield Railway-based trust is currently awaiting the outcome of funding applications to have the body restored, but engineer Dave Donkin has already completed the modifications to the frame for the coach, which is now in store at Caverswall Road. In tandem with this the trust has sent the body of NSR First Class four-wheeler No. 228 to Stanegate Restorations at Haltwhistle for assessment pending a full restoration. No. 228 dates from the mid-1870s and is on long-term loan to the Knotty Trust from the North Staffordshire Railway Co (1978) at Cheddleton. Stanegate restored the trust’s two third class carriages – Nos. 61 and 127. The trust will assess the body’s condition to determine the level of work required, which in turn will act as a guide for funding. When restored No. 228 will provide a stark contrast to the austere third class stock. It originally had three sumptuous compartments that featured sprung and upholstered seating, luggage racks, blinds, and a lined-out ceiling with the NSR name at each corner. However, at the moment no underframe exists for the coach, and the trust is looking for a suitable pair of 3ft 6in wheelsets with a view to either building a new frame, or modifying an existing one to suit. See www.knottycoachtrust.org.uk/project28.html for details on how you can support the project.